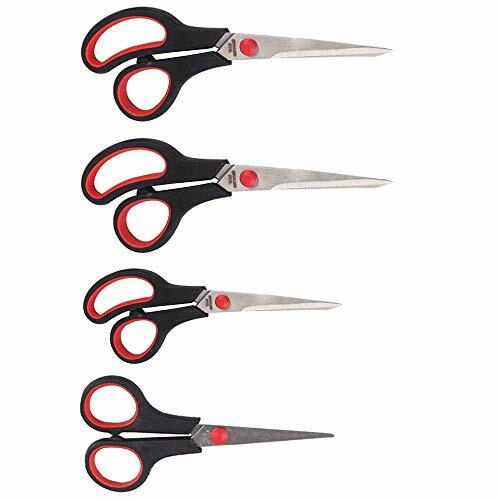 Scissors Set of 4 includes 8 inch scissors, 8 inch scissors, 7 inch scissors and 5.5 inch scissors, MULTI-PURPOSE AND VERSATILE Ideal for smooth, efficient cutting paper, cardboard, fabric, photos, and more. scissors is designed with durable wear-resistant stainless steel blades. the precision tip ensures clean, accurate cuts for detailed projects, they stay sharp and effective even after long use. Soft Comfort-Grip Handles fit any-size hand and that work well for both left- and right-handed users. The handles come with a soft-grip surface to ensure comfort even during long cutting sessions. The ultra-sharp blades make a great choice for craft projects, effortlessly cutting through paper without tearing or snagging. Perfect for the Office, School, Home- Used by Teachers, Kids, Students, and Adults. Ideal for Household Projects, Class Projects, Arts & Crafts, and Kitchen Duties. Great for Cutting Paper, Cardboard, Thread, Tape, & More! Note: Scissors recommended for use for children ages 4+. Adult supervision required. XINOFFICE scissors offer large loop handles that fit any-size hand and that work well for both left- and right-handed users. The handles come with a soft-grip surface to ensure comfort even during long cutting sessions. XINOFFICE scissors is designed with durable wear-resistant stainless steel blades. the precision tip ensures clean, accurate cuts for detailed projects, they stay sharp and effective even after long use. Great Scissors for kids and adults, sharp pointed scissors perfect for school, office, and home. The best to use for arts n crafts and projects too! If you have any questions about this product by XINOFFICE, contact us by completing and submitting the form below. If you are looking for a specif part number, please include it with your message.